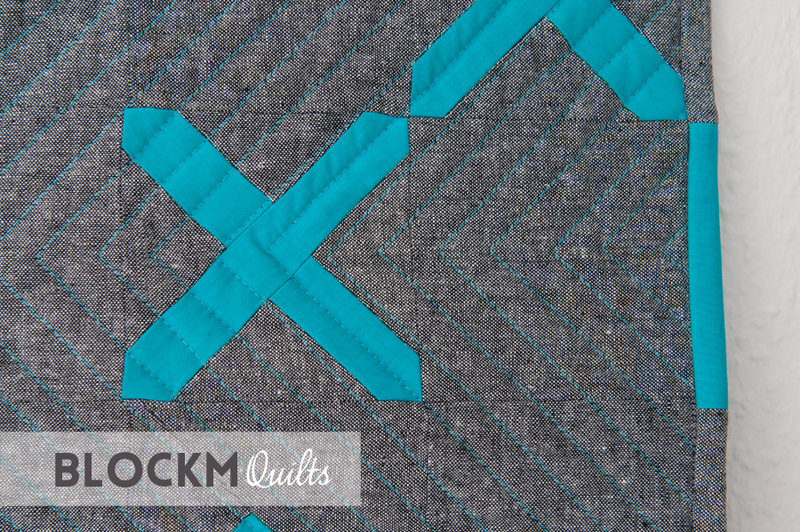 I am a month late with the February challenge of the Mighty Lucky Quilting Club. But I can blame QuiltCon for that, and that is not a bad thing. The February Challenge by Emily Herrick was the X- Block. I immediately had a design in my head that I would just not finish all the blocks but have them halved, quartered and three-quartered. Very quickly I had a name as well: Broken X.
I chose Robert Kaufmann Essex Linen and a very bright turquoise solid from Michael Miller Cotton Couture. The colours are just so vibrant and the fabric feels so good, too! The individual blocks are 4" square (unfinished) and Broken X is 24 x 24" big, or rather small I should say. It's wall hanging in my new sewing corner now and I love how the grey quilt and the grey painted wall harmonise! I actually combined the February and March Challenge in one quilt. 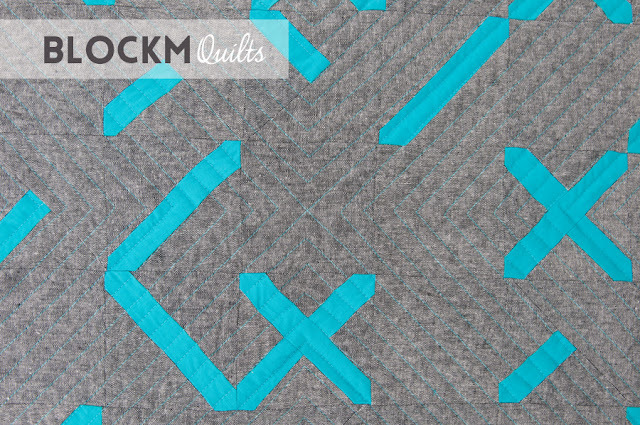 The March challenge was all about quilting with your walking foot by Jacquie Gering. 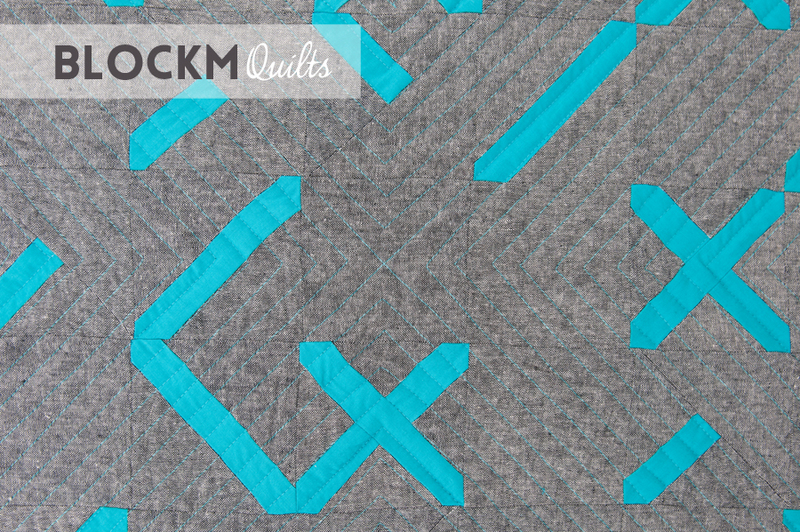 I opted for an X in the centre of the quilt and then echoed the lines in. The challenge actually was to mimic shashiko stitches but I had difficulties enough with these straight lines. The pressure foot pressure on my machine cannot be adjusted and that causes me trouble since quite some time. First I thought the puckering and fabric shifting issues I'm having was me and due to improper preparation but believe me it's my machine. Very unfortunate that is, actually. I don't think I can do this design with a bigger quilt. The quilting stitches are 1/2 inch apart and I used beautiful Aurifil wt40 thread in colour #5005. The thread really stands out on the Essex linen and matches the turquoise solid perfectly. I really enjoyed the challenges and will attempt shahsiko quilting another time. Can someone just please tell me I NEED that Juki? 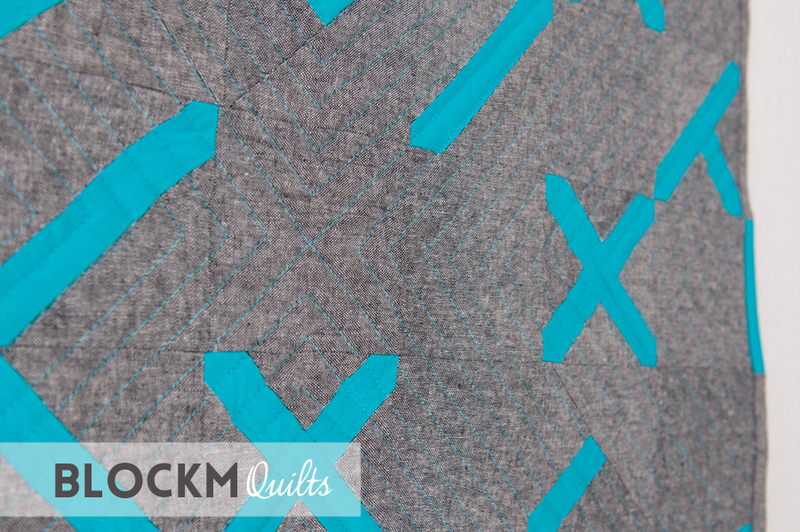 I love the texture of the fabrics and the quilting with the 40 wt thread. I've been wanting to invest in some heavier threads for quilting, too. If your machine is causing you grief, you definitely need a new one. A machine doesn't have to be expensive to do a good job of quilting. I've been thinking about a Juki, too, but last year I bought a used, smaller Bernina that makes the loveliest quilting stitch. The throat space isn't very large and it may not be built for the amount of quilting that I do, but it feeds great with the walking foot. No puckers and nice, even stitches. I really love this! The blue is gorgeous and the quilting in a coordinating color is perfection! Very very cool! Great to see something that is a bit different. You need a Juki. You are welcome. I really like this! Such a fun design... I treated myself with a new Juki 18 months ago and it was the best decision I had made in a long time! No more puckers, no more tension issues... just fabulous quilting stitches... all the time!! Super schön geworden. Und das Quiltgarn ist eine perfekte Wahl gewesen. Den würd ich mir auch sofort hinlegen. Ich hab das Essex Linen jetzt schon so oft bewundert und immer noch nicht bestellt. Jetzt wird es aber langsam mal Zeit! 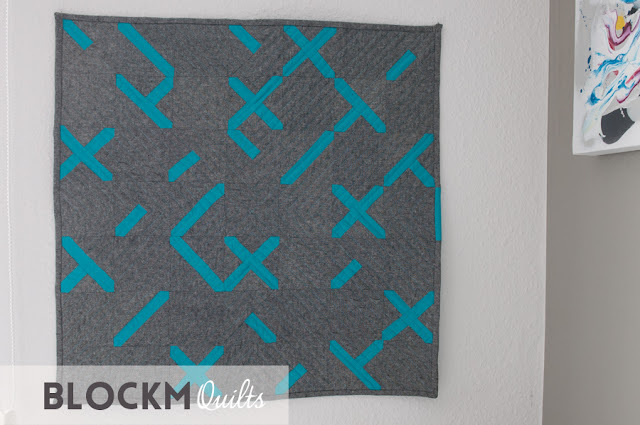 Such a great design and I love your quilting! 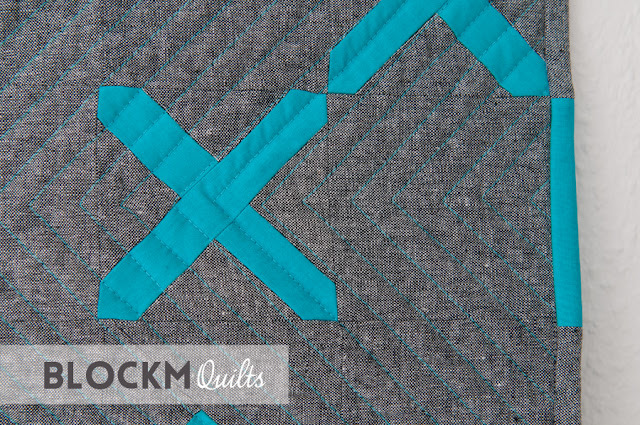 Love the quilt design & the thread looks really great on the background. Gorgeous! Hope you will enjoy the quilt a lot. I love your broken X and I love your color choice. What about the Juki? Are you still interested?